We seem to go to a lot of parks during the summer, because there isn’t much going on in the woods or on the coasts. 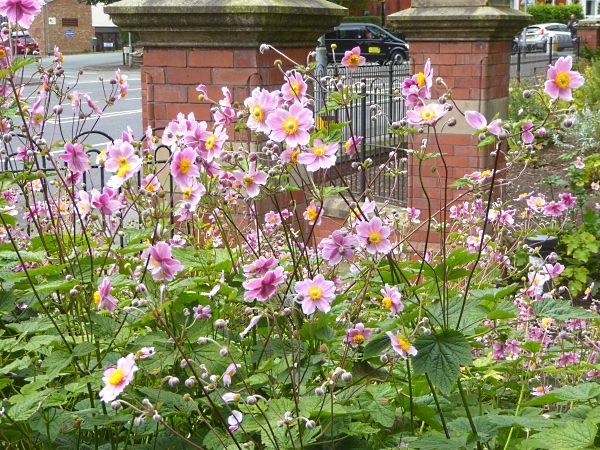 Taylor Park in St Helens greeted us with a fine display of pink flowers by the gates. Japanese Anemones? There were Wood Pigeons in the trees and several spotty young Robins on the path. The lake itself had the usual Coots, Canada Geese, Mallards, Black-headed Gulls and one Muscovy Duck. On their notice board the park claims to get Kingfisher, Pochard and Goldeneye, but none of them were there today. 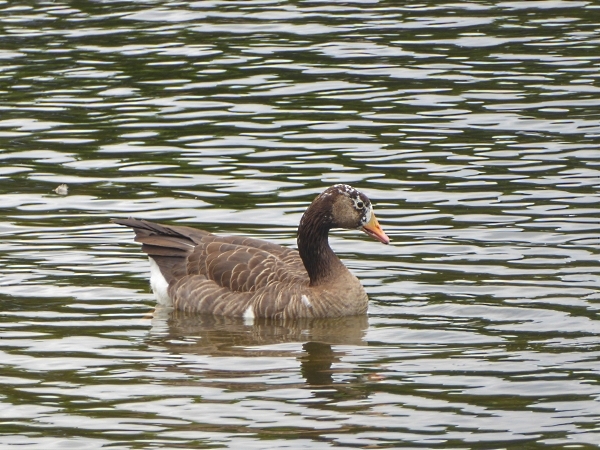 But they had a pair of Mute Swans, one distant Tuftie, some House Martins swooping acrobatically over the water, and one Greylag Goose which looked like it had some White-fronted Goose in its ancestry. We lunched in the sunken garden, which is an old quarry, and they have a collection of stumps of petrified trees known as Bog Oak. We took a muddy side path and found a smaller lake used by fishermen, which I think was Eccleston Top Dam. It must be deeper than the main lake, because there was a Great Crested Grebe on it. 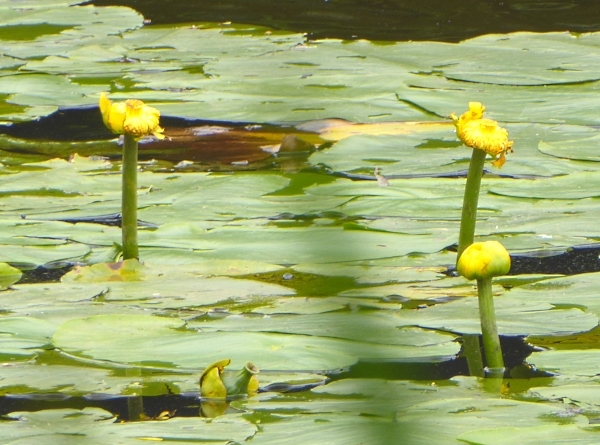 The water lilies with their small yellow flowers and almost-submerged bottle-shaped seeds were Yellow Water Lilies, for which we get I-Spy points. 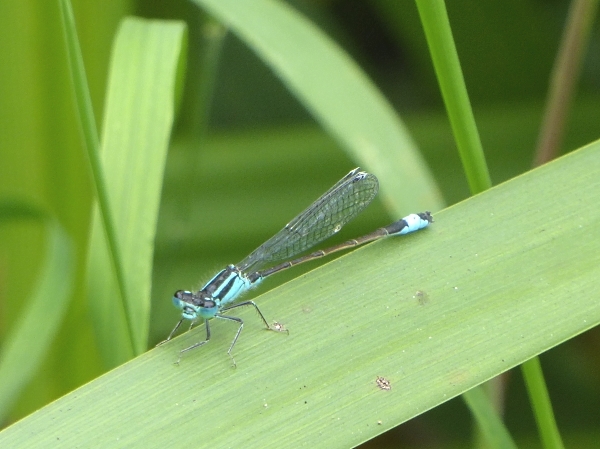 On a reed leaf was a Blue-tailed Damsel Fly. 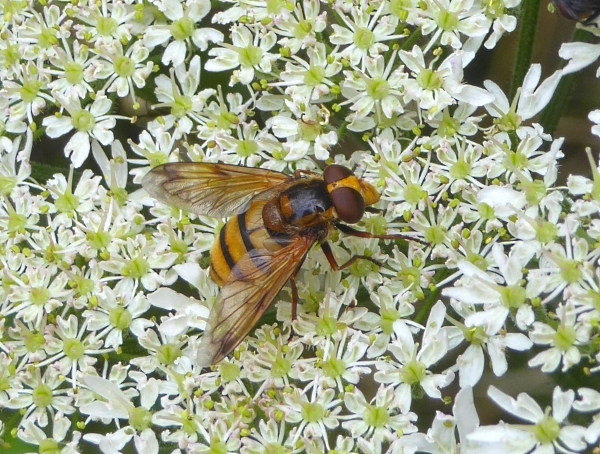 Another good insect was this one on Hogweed, which I think is a Hornet Mimic Hoverfly Volucella zonaria, Britain’s largest Hoverfly, which is extending its range northwards as the climate warms. There were interesting wild flowers near that fishing lake and in the damp woods around it. Himalayan Balsam , of course, Self-heal and Water Mint. I wanted one of the small Dandelion-ish flowers to be Smooth Hawk’s Beard, which is in the I-Spy book, but now I have looked at all the dozen or so Hawk’s Beards, Hawkbits and Hawkweeds I realise that they are very hard to identify and I’m not so sure. 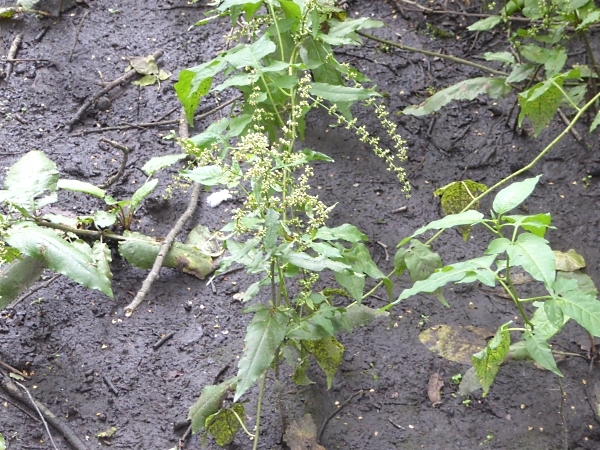 There was also this plant gowing in the shade. Not Enchanter’s Nightshade, which I know, and too late for Dog’s Mercury, so was it Wood Sage? But the leaves weren’t crinkly like the other sages. No idea what it was, but there was quite a lot of it. There were White Water Lilies on the main lake, with just the flowers poking out of the water and no apparent leaves. There were two broods of young Mallards, still being shepherded by their mothers. One pair were a bit fluffy, but other brood of four teenagers looked fully grown. A well-grown young Coot was begging food from its mother, but she looked fed up and kept fending it off. 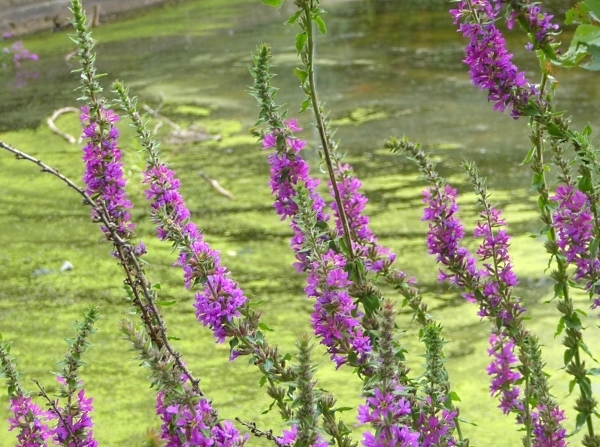 The Purple Loosestrife was in fine bloom. 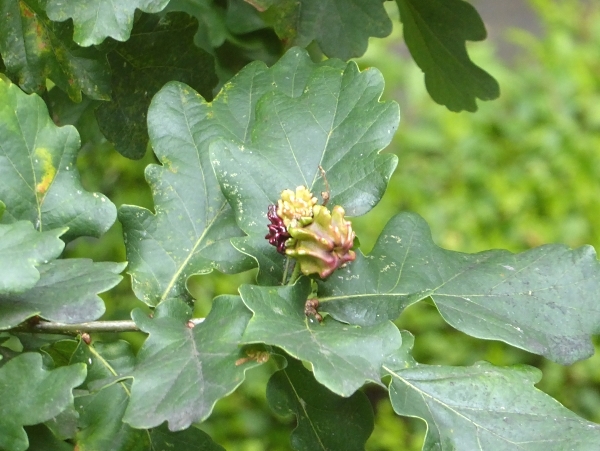 The Oak trees in the park seemed to have been badly infected with Knopper Galls, and we saw no developing acorns at all. Today’s bus journeys were long ones, so we did some spotting from the top deck. One major road junction had a flock of several dozen Starlings on a roundabout, and we saw two Swifts on the way home. 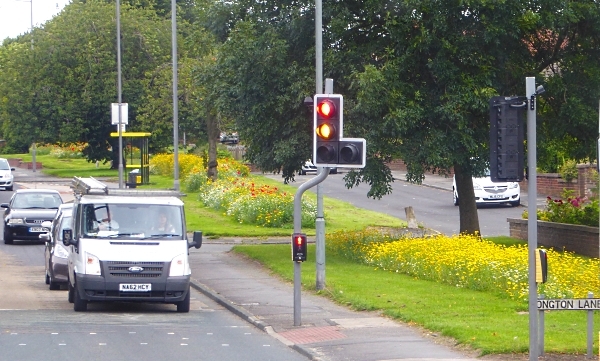 Praise is due to Knowsley or Rainhill Council for a lovely display of wild flowers in sinuous beds along Warrington Road near Rainhill station. They have planted the standard mix of Poppy, Cornflower, Ox-Eye Daisy and Corn Marigold, but the effect is very pretty. No additional trees or birds today, but we got five new flowers worth 110 points and so we are now officially I-Spy Super Spotters with 1005 points. Today’s surprising score was greatly helped by the 50 points for the Corn Marigold, which is rare in the wild but common in the roadside wild flower mix. That feels a bit like cheating, but we will take it! Public transport details: Bus 10A from Queen Square at 10.15, arriving Prescot Road / Toll Bar at 11.15. Back from the stop opposite on bus 10A at 2.22, arriving Liverpool 3.20.